Zirconia Ceramic Ball Valves,CSG00038,Ball Valve,China Southern Advanced Ceramic Technology Co., Ltd. Structure Ceramic Ball Valves is a hi-tech product, which developed by the imported technology and equipments on the basis of the research achievement of the National Seventh Five-year Plan. It obtained the Certificate of National New Product in 1995 and two items of Patent. Structure Ceramic Ball Valves is a recommended product to the market of The European Commission by China Council for the Promotion of International Trade (CCPIT). Structure Ceramic Ball Valves is very excellent with low-cost, hi-economy, long life (2~4 times of Titanium Valves), extra resistance to corrosion, high temperature, wear and erosion etc.. It can be widely used in transportation systems of various acid, alkaline or saline gases, solutions, high temperature steams and slurries, in the lines of oil industry, metallurgy, papermaking,power station, refinery, etc.. StructureCeramic Ball Valves is an ideal substitute in strong corrosion situation for the Titanium and Monel Valves. There are four types of driving performances, manual, pneumatic, pneumatic-spring return and electric. Various special valves can be designed on demand. 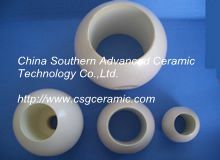 Furthermore, various high wear-resistant, corrosion-resistant and high temperature-resistant ceramic components, hydraulic pressure sealing components can be provided as well. Leakage for hard sealing ball valve agrees with the grade of B.C.D, according to the standard of ISO5208-91, GB/T13927-92 or the agreement between supplier and buyer.